Get TT Certified and Help More Clients Lose Fat With The Most Effective Fat Loss Training System in the World That's Based On The Latest Fat Loss Science and is Backed By Research and Real World Experience! Reserve your spot now – before the Early Bird Discount expires on Tuesday, January 21st, at midnight est., and you’ll save $300 OFF the regular price for the Tampa CTT Live! Event, January 31st – February 1st. The year was 1979. I was just 4 years old, riding shotgun and without a seatbelt (because there were no laws back then) in my mom’s giant green boat of a car. The sun was shining, and we were on our way home from town. It should have one of the happiest moments of my young life. But even though I was just a child, I could sense that she was upset by something. She turned to me and explained that she had just been to her Weight Watchers meeting, and that she didn’t lose any weight. That made her sad. Though we rode in silence the rest of the way home, I’ll never forget how that made me feel. To see my mother so helpless and so hopeless, so frustrated and so ashamed, so hurt by her perceived failure, it changed the way my life would turn out. It’s one of the very first vivid memories I have in my life and it impacted me so much that over 33 years later I’m still thinking about it. And more important, it’s still driving me to help people overcome their frustrations. In fact, it led me to become a personal trainer, and then to get a Master's Degree in Exercise Physiology. It drove me to spend hours in the lab, library, and gym, perfecting my fat loss system. I'm guessing you can relate because you and I are a lot alike in that we both want to help others end their frustrations and struggle with fat loss. Am I right? 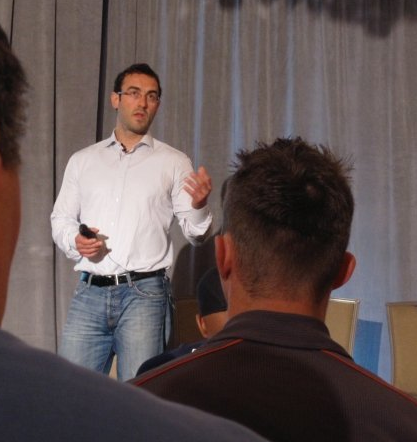 Hi, this is Craig Ballantyne from the Turbulence Training Transformation Certification Program - the most advanced Fat Loss Training System in the world, and the ONLY Certification that also shows personal trainers how to help more clients and make more money. I’m thrilled and excited that you decided to join us on our 10 Million Mission, a mission has been over 33 years in the making. Ten years ago, in 2001, I published the first article on Turbulence Training on the internet. Then it grew into an eBook, an Amazon.com best seller, workout DVDs, a membership site, hundreds of videos, a Turbulence Training Facebook Fanpage and an email list of over 95,000 people. And now, finally, the Turbulence Training Certification. What Makes the Turbulence Training™ Certification Different? The Turbulence Training Certification Program is not like other generic certification programs. In fact, it’s different for three major reasons. The first is that the Turbulence Training Certification Program is based on teaching fat loss workout program design, so showing people the best way to help their clients lose fat in a minimum amount of time. The second component that makes it much different from generic certifications is that the Turbulence Training certification is based on bringing trainers the latest in fat loss science. Every month I’m researching the latest fat loss science, reviewing research studies, testing new programs with our clients and bringing it back to the Turbulence Training world, so we get a lot of feedback. And that way we’re able to always be refining the science so that our information is given out monthly, as opposed to textbooks that just change on a five or ten year basis. But the third and most important aspect of the Turbulence Training certification that sets it apart from so many other certifications is our 10 Million Mission – to help a million people, a million busy men and women transform their lives by the year 2020. In the next ten years as we move towards that 10 Million Mission, we may see a lot of opportunity come our way for us to help people in ways that are just greater than fat loss. So we don’t want to just minimize the positivity that we can bring to people, the transformation aspect. We don’t want to just pigeonhole it there with fat loss. So we want a body and life transformation training. Turbulence Training has become the ultimate fat loss workout system and the rest is history. Now it’s time that YOU help me take it to the rest of the world. The Turbulence Training Certification allows you more opportunity and recognition than any other fat loss certification in the world. It will help you get what you deserve as an elite personal trainer focusing on transforming the lives of men and women everywhere. ...Imagine owning the #1 recognized Fat Loss Certification in the world, and being recognized locally as your area's top fitness and fat loss expert allowing you to help hundreds of local clients achieve their goals and being part of our 10 Million Mission to help over a million people worldwide to transform their bodies and their lives. Now imagine all of this supported by Turbulence Training creator Craig Ballantyne and his Turbulence Training Team dedicated to guiding you to success every step of the way. Why a Turbulence Training™ Certification? It all started with an email I received back in 2003, if I recall correctly, from a TT reader asking me if there was a certified TT trainer in her area. After a dozen more requests just like this, I soon started receiving requests from trainers who wanted to get certified with the Turbulence Training system. And not a week goes by where I don't hear from a reader or trainer who is requesting access to a certification. It's incredible. I never thought I would be this lucky, to have so many people using the Turbulence Training system, and again, as I've mentioned, I'm eternally grateful. So finally, after over a year of hard work and figuring out exactly how to help the most people possible with the TT Certification, it's finally done. And I hope you're ready to join me on the 10 Million Transformation Mission that I've built into the Certification. Your chance to join the TT Century Club will never be available again. There are only 100 spots open, and the first 85 spots have been taken. As you'll discover in a moment, I could take an unlimited number of trainers. But I'm not going to rush anything. Instead, I'm going to accept 100 trainers - and 100 trainers only - to start our "TT Century Club". These 100 trainers will forever have my gratitude, and will always be on my "radar" when it comes to making opportunities available. If you plan on being one of the first 100 people to get certified, let me thank you in advance. As I've mentioned, this has been a lifelong labor of love to bring Turbulence Training to the world, and now as a Certification program for the fitness industry. And your support in these early stages of our 10 Million Mission means the world to me, and so as long as you remain a member of the TT Century Club, I'll forever be rewarding the first 100 trainers who "took a chance" on the TT Certification. On "Planet Turbulence", you'll also receive unprecedented coaching from me, Craig Ballantyne. I put together this mission this summer over the course of 2010 as I was reading amazing books such as Good to Great by Jim Collins and the Rockefeller Habits by Verne Harnish. I discovered that in each one of the best businesses in each industry, they all came down to core values and to missions and purpose and values. And so what I decided was I had to come up with a very powerful mission for Turbulence Training – to help 10 Million people transform their bodies and their lives. This is the ONLY certification program with a Transformation Mission. But I realized that I couldn’t do that on my own. And so I decided that with a thousand trainers helping a thousand clients, we can help a million people transform their bodies and their lives by 2020. And I know that with the help of you and other advanced trainers that we’ll be able to reach that million mission mark much sooner than even 2020. So that’s what sets it apart is the mission of Turbulence Training. Who is the Turbulence Training Certification for? Are enthusiastic as heck about transforming the lives of 10 million men and women around the world? Then the TT Transformation Certification is for you. On "Planet Turbulence", as a TT Century Club and Inner Circle member, you'll also receive unprecedented coaching and opportunities from me, Craig Ballantyne. What Do You Get With Your Turbulence Training™ Certification? As you know, the Turbulence Training Certification is different from every other certification out there. 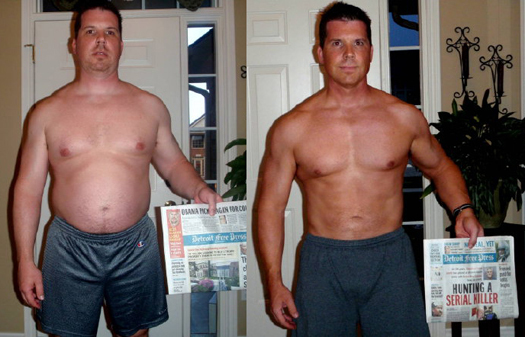 When you become a TT Trainer, you'll instantly become part of the fitness industry's biggest and boldest mission of helping over 10 million men and women transform their bodies and their lives. Plus, you'll not only be given advanced program design education that has been used in more than 100 Turbulence Training workouts to help over 25,000 men and women around the world to lose fat, but you’ll also get Client Attraction secrets that have - until now - been limited to the world's top trainers. You'll receive instant access to the online video AND you'll have the DVDs "delivered-directly-to-your-doorstep". The TT Certification was filmed live in Toronto featuring the best fat loss program design material of any Personal Training Certification. You can't put a value on being able to set yourself apart from every other trainer in your city when you become one of the limited number of trainers to get licensed access to use the Turbulence Training Registered Trademark in your business. 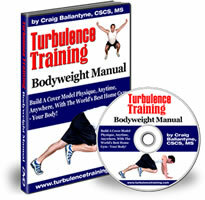 Only Certified Turbulence Trainers will be able to give their clients OFFICIAL Turbulence Training workouts. As a TT Trainer, you will have your own dedicated webpage on the Turbulence Training Certification website, where you will be able to promote your services for your area. I have a team of website experts standing by to drive traffic to those pages so that when folks in your town go on the Internet to look for a personal trainer, we'll be working on getting your name to the top of the rankings. Again, you can't put a price on this benefit, because it could lead to any number of clients investing in your services. 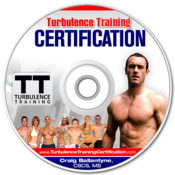 Along with the TT Certification Seminar videos, you'll get a copy of the Turbulence Training for Fat Loss and Turbulence Training 6-Month Bodyweight DVDs to show you the complete library of exercise demonstrations for the most popular TT workouts. These will ensure you have everything you need to provide the perfect TT workouts to your clients. This bonus seminar footage shows you over a dozen tools you can use instantly and automatically in your business to attract more clients. And because they are easy to use, these tools will allow you to get more clients while you focus on what you want to do - and that is training clients. Each month, the latest issue of my TT Fat Loss Program Design and Research Update will be delivered directly to your doorstep, featuring exclusive access to the latest fat loss workout tips, fat burning exercises, and program design secrets of Craig Ballantyne and other Certified Turbulence Trainers. You'll also receive my insights on the latest fat burning research and how to use this science to help your clients get more results and transform their bodies. This hour-long interrogation of one of the world's best personal trainers will also be delivered directly to your doorstep each month. I'll be grilling world-famous trainers, as well as "underground transformation specialists", including other Certified Turbulence Trainers, so that we can discover new ways to get more results. It might even be YOU one day. You're easily going to be the most knowledgeable trainer in your town with these monthly updates. With each month's "Done-for-You" client attraction system, you'll be able to just "plug and play" the system for more clients. This tool is delivered directly to your doorstep, for instant implementation to get more clients into your business and into the 1 Milllion Mission. I'm really excited about this feature that gives you an insider interview with one of the world's most successful fitness professionals, including other Certified Turbulence Trainers. Again, it might even be YOU one day. This audio will share exactly what you need to do in order to get more clients, build the best bootcamp, or open the best personal training facility in your town. Each CD will be packed with instant success tips and action plans. For the life of your TT Trainer career, you'll always receive a complimentary Platinum Membership to the TTMembers.com website, where you'll have access to every program in the Turbulence Training library. (Although frankly, it's potentially priceless because of the access to the TT Trademark and your listing on the "Find a TT Trainer" website.) And of course, that is not all. You’ll get a lot more when you join the TT Century Club of the TT Certification. In addition to all of that, you'll receive these bonuses if you are one of the first 100 trainers to get certified. The total value of the TT Certification is well over $3000. But for the first 100 TT Trainers to join, the investment in your TT Certification is only $1297 + $97/month (or 3 payments of $497). Because so many Turbulence Training readers, especially those interested in the certification, live all over the world, I knew that doing small group seminars each weekend was not going to help us achieve our 10 Million Mission. That's why all of the TT Certification materials will be available ONLINE - and you'll be able to get immediate access to these videos and transcripts today. So if you live in Australia, or England, or the Middle East, or South America - as many TT trainer hopefuls have mentioned - this won't stop you from gaining access to the TT Century Club and being one of the first 100 Certified Turbulence Trainers. You won't need to spend thousands of dollars in airfare and hotel bills, plus travel 4-5 days away from your family, in order to become Turbulence Training Certified. In fact, my #1 concern with the Certification was making sure every interested trainer would have access to the system. That's why I created the online delivery for this exclusive content, and you'll be able to be part of the Mission from home. That said, I really hope that you'll make the journey to Toronto later this year for the 1st ever Turbulence Training Certification event. More details on that coming soon to every trainer in the TT Century Club. With our mission of a million transformations, we have to come together and create programs that will help people lose fat, get healthy and dramatically improve their lives. That’s obviously a given, but it’s also a transformation certification for trainers like you to transform your business. With each Turbulence Trainer helping at least one thousand clients, we’ll beat our 10 Million Mission of 10 million transformations before 2020. If you’re a boot camp trainer, or a one-one-one trainer, or a semi-private group trainer, we’re going to show you how to attract more clients into your business. But at the same time we’re also going to show you how to design your life so that it’s exactly the way you want it to be. You’ve worked so hard, you deserve to have the lifestyle that you really want to design. Our purpose, even more important than that, is to help people overcome frustration, build their confidence and increase their self-esteem. That’s what we’re going to do in our transformations. Because we want to help change and transform lives. We have a higher purpose here, and that is to push people and help them reach their peak potential. And why the passion? Everybody out there is going to have their own individual reason. I started off wanting to help my mom, and it’s transformed into something bigger – MUCH BIGGER. And whatever it is that is driving you to help people to transform their lives, whether it was because you had been a transformation in the past or whether it is because you had seen a family member who had struggled with weight, or whether you just really, really like the science of fat loss. That’s what we’re going to be helping people with here. Taking our passion and our purpose, taking the secrets that we know and helping so many people discover this information that allows them to make the changes that they need to so that they can transform t heir lives. It’s really, really important. So our purpose is to help people transform their lives, the bottom line. That is what we are going to focus on with the information that we have, and we’re going to take it to as many people as possible. We’re also going to build the Turbulence Training world. 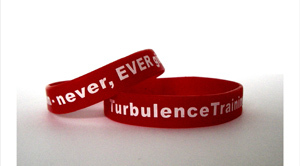 In addition to providing more information to more clients, getting manuals, getting DVDs, getting books out to people, we’re also going to be doing everything that we can to put little things into their lives like these bracelets, these Turbulence Training bracelets that have the slogan “Never, ever give up” on them. Plus with the large number of people we’re able to help, we’re able to do studies with our own clients and report feedback on doing things different ways and bringing you what works. The latest of what works, not only in the physiology of fat loss, which is extremely important, but also in the psychology of fat loss which I’m discovering is much more important as we go along. Yes we can give them information on what to do, but on how to get them to stick to it is very important. So as you become a better trainer, of course you’re going to attract more clients into your world. But in addition to that we’re going to show you how to get more people into your boot camp, more people into your one-on-one training, more people into your group training. Who do we serve? Who are we helping? It’s people like this, the busy men and women who want to transform their lives, transform their bodies, lose fat, have more energy, gain more self-confidence, more self-esteem and overcome those frustrations we mentioned before. That’s very important. And so we’re responsible to people like Molly and people like Jay. Molly’s gone on to have an amazing transformation. Plus she’s been one of those life transformations where she’s even gone on to become a personal trainer. And we’re going to hear so many of those. Because once people learn the information, and they understand how to apply the information that we’ve been taught in university or certification programs before, they want to share that stuff with other people because they bring that positive mindset and that “can do” attitude. And so it is people like Molly, people like Jay that we want to help - first by transforming their bodies and their lives - those are the people that we are responsible to, and I take that very seriously. That’s why you are here. You’re not satisfied with just one certification. You’re not just satisfied with ten clients. You’re not just satisfied with two boot camps. You’re always learning. You’re always improving. And that’s what we do on a monthly basis. You’re going to receive monthly materials on both the science of fat loss and on how to build your business. You’re also going to get access to the client attraction website. So again, that’s simply just going to be listing all the Certified Turbulence Trainers around the world, plus interviews with them, profiles on my blog so that we always have information and make sure that people in those cities where you live know that you’re out there to help them. And so that will be one way to get more clients into your business in-person if you want to do more boot camps, if you want to do more one-on-one training, and also online training as well. One of the things that eats up most of your time is coming up with new and innovative workouts so your clients never get board or plateau. Certified Turbulence Trainers will have access to over 100 of the most effective, fun and proven done-for-you workouts from the Turbulence Training library. I've done the work so you don't have to. Every year, there will be a Turbulence Training Certification Seminar hosted by Craig Ballantyne where top TT Trainers from around the world get together to share their most powerful "what's working now" strategies with the Turbulence Training™ Community. Plus you’re going to get access to come to the annual Turbulence Training trainer seminar where I’ll be there, obviously, teaching the science of fat loss. But we’ll also have guest speakers providing cutting edge nutrition advice along with other fat loss experts to help you become an even better trainer. Plus we’re going to have business building mentors to show us how to get more people into our boot camps, into our one-on-one training, into our studios, whatever we need to do, even better online coaching. So as a gift, you’re going to have free access to come to this seminar every year. Those two aspects received on a monthly basis will allow you to always be learning and improving. And that’s what I’m doing on a constant basis, from coaching that I get personally from other people, from all those research studies that I review, from all the experts that I interview and then pass on to you as part of the certification program. So that’s all the stuff you’re going to get. Well, there’s going to be a lot more actually, including the monthly materials and bonuses as well. But that’s our mission. That’s our goal is to help you become the best trainer possible because we’re going to have a thousand trainers, a thousand clients and a million transformations. And I can’t wait to get started on this and to work with you and to reach that goal. After that, I'm shutting it down until we get these 9 new trainers set-up and running. To be honest, I don't know how long those 9 spots will last. It could be 12 hours, it could be 2 days. But they won't last long, that's for certain. After all, we've had over 100 comments on the site from eager trainers around the world, and since the Turbulence Training Certification is delivered online, that 9 spots will be available to trainers from every country, not just to trainers close to TT Headquarters. So I hope you're as excited as I am for today. It marks a dramatic change in the fitness industry. We're saying so long to "cookie cutter" generic certification programs and we're entering the world of specialization programs, where trainers will become even better at what they do. Our purpose here is to do something meaningful and lasting. That’s much greater than just the contribution of each individual. When you have a greater purpose than just yourself, when you have some type of mission or value, that brings together people, and they work towards something much harder than if they were working on their own. So we want to leave some type of legacy here. We want to have people in 50 years from now thanking you and thanking Turbulence Training, thanking all the people that have given them support in the Turbulence Training world for helping them transform their bodies and their lives, for helping them rediscover the passion in their lives. And again, that’s coming to think of people who have transformed their bodies and now want to get into helping other people transform their bodies. And we also want to be helping people reach their peak potential. So that’s going to be the legacy of Turbulence Training. So it’s much greater than you or I or even a group of trainers. It’s much, much greater than that, and it’s helping and reaching that 10 million mission. With the Turbulence Training™ Certification, you can always know that we'll be here for you. PS - This is Your ONLY Opportunity to Join the Exclusive TT Century Club Limited to the First 100 Trainers. 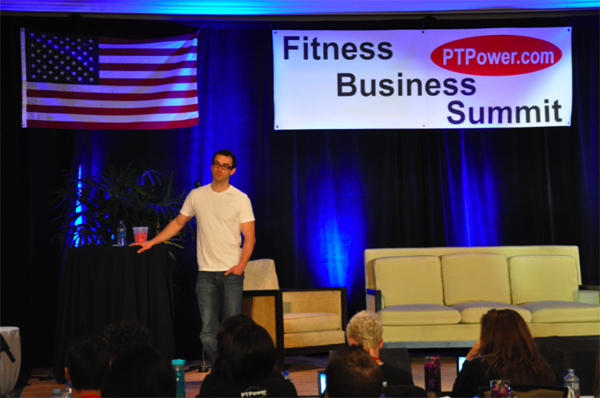 PPS - Only TT Century Club Trainers will enjoy free access to the annual TT Certification event. 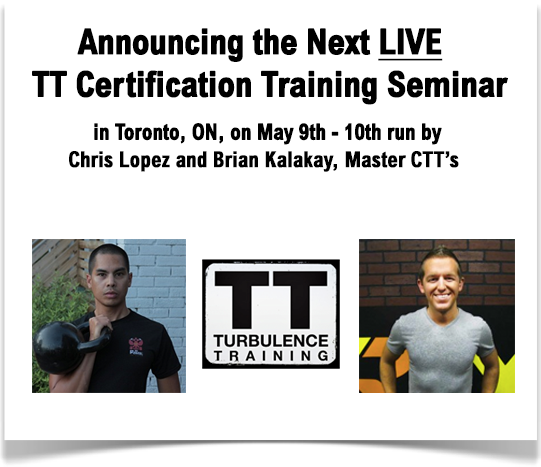 In the future, Certified TT Trainers will invest up to $497 to attend the yearly workshop and coaching program.